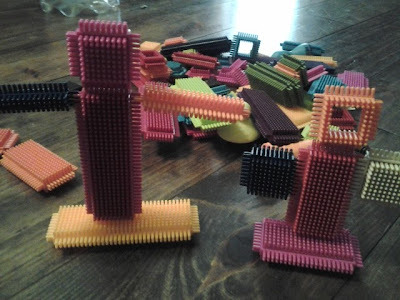 I love these pokey blocks. 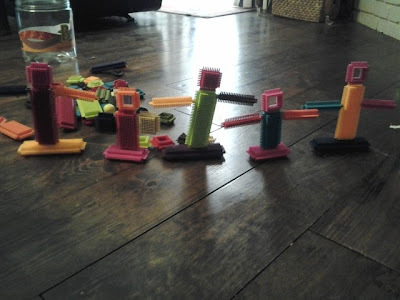 They are officially called bristle blocks, but it's pokey blocks at our house. Katie said, "I made us!" So this is mommy and Katie. I guess we should adopt them now since they are apart of our pokey block family! 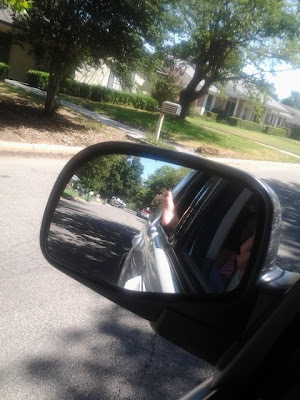 I had to capture Katie's little tootsies hanging out the window. She likes to roll down the window when we get close to home. Even though it's still 1 million degrees outside. And she makes herself comfy with a foot flowing in the breeze. Last night we went to Courtney's house. 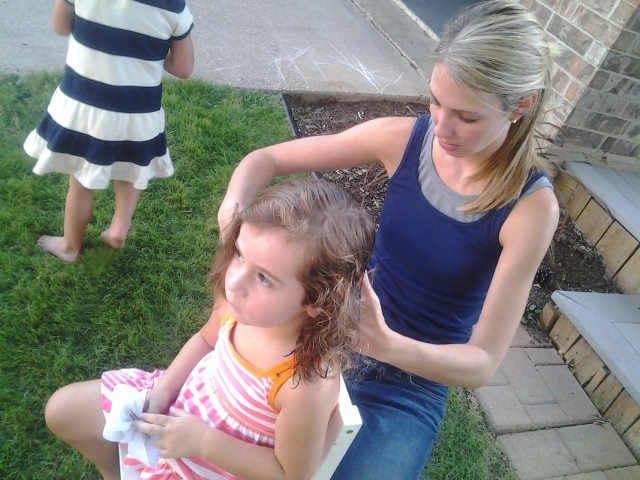 And we decided to give Katie a little trim. Even though she just had a hair cut, it was getting out of control. Courtney knows what's she's doing, but I decided to cut first and let her clean up the mess I made. It felt good to cut it off! I cut a lot! And then I couldn't quit laughing. It was a nervous laugh! Thankfully her hair is curly and it covers an amateur hair cut! 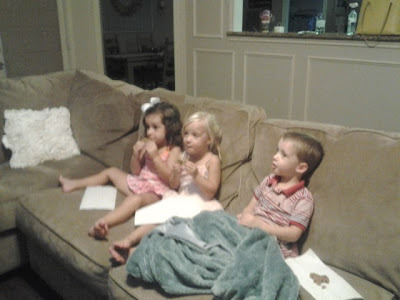 I need to get a better hair do picture, but here she is with Charis and Drew eating cookies on the couch. Good friends make life more fun! So that was yesterday, and today no pictures were taken, but I did make a blueberry cobbler! I got the recipe from the Pioneer Woman. Hers is blackberry, but I improvised with blueberries. It was super easy and you can find the recipe here. If I can do it, anybody can do it! Tomorrow we will be getting ready for our first day of school. It will take me a whole day to prepare to be on a schedule again! She is so cute with the hat! Well, I hope you take tomorrow and do something for yourself! I had alot of plans to clean, garage, bathrooms, laundry on the first day of school and found myself still in my jammies at 12:30 frozen in time starring at mindless TV wondering what to do first. Ha. Hope she has a great first day!and you too!! You laughing while cutting Katie's hair was hilarious. I would love to see the look on an adult's face when you cut their hair and then went into hysterics. She looks precious! That can be our next prank.